My family’s hands-down all-time favorite cookies are these oatmeal raisin nut cookies. 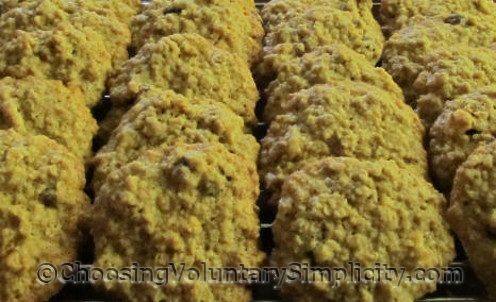 They start with a recipe for plain oatmeal cookies… I’m not sure, but I think the original oatmeal cookie recipe might have come from the back of a Quaker Oats box. I always add about a cup each of raisins and walnuts. Thoroughly combine flour, baking soda, and salt, then add to the sugar mixture. Mix well. Stir in oats, raisins, and chopped walnuts. (Either the quick or old-fashioned type of oats is fine.) The dough will be quite stiff. Drop by rounded tablespoonfuls onto cookie sheets (greased). Flatten the dough slightly but not too much, because as the cookie bakes, the dough will naturally spread out. Bake 10 to 12 minutes or until golden brown. Let the baked cookies cool for one minute on the cookie sheet, then remove them to a wire rack. Yield: three to four dozen 3 to 3 1/2-inch cookies. These cookies are extra, extra good when they are warm from the oven, and they freeze well too. Last night I made a double batch and froze cookies in “snack size” portions. Delicious! Just made my first batch. They are very similar to the only cookies my mother ever made, and her recipe came from two generations ago! This blog title is 100percent absolutely correct. These cookies are delicious and they’re easy to make too. Thanks for sharing another great recipe. I have made these cookies a few times and I make a batch and put most of them in the freezer because if I don’t I swear I would eat the entire batch, they are so good. If you haven’t tried the recipe you should. These cookies turned out excellent! I made mine gluten-free by using a gluten-free flour mixture, gluten-free oatmeal, and adding 1 tsp. xanthan gum. Great recipe! These were the first cookie I ever made, and yes, they were from the back of the Quaker Oats box! They are the PERFECT oatmeal cookie — the flavor of the oats shines through because they are not all garbled up with cinnamon and allspice and such. FABulous!